Female Melissodes. A still from the field video below. Identification: Melissodes individuals are robust and hairy, with especially hairy rear legs and bands of pale hair on their abdomens. The females carry pollen in the scopae. The lower front of the male faces are frequently yellow. Furthermore, males have characteristically long antennae. Foraging Habits: Melissodes are associated with sunflowers, though many are aster or daisy specialists. The males will patrol around sunflowers during the day and sleep in the flower head in clusters. They fly from midsummer through fall and are active during the mornings and early afternoons. Nesting Habits: All Melissodes nest in the ground. Most are solitary and will excavate nests in flat ground, but some dig horizontal burrows in exposed banks. A few species live communally, where several individuals share a nest entrance but work for their own brood. Note the difference in behavior between the male and female Melissodes. The female circles the flower meticulously, collecting the bright orange pollen. The male, who does not collect pollen, haphazardly searches through the flower head, perhaps searching for nectar. 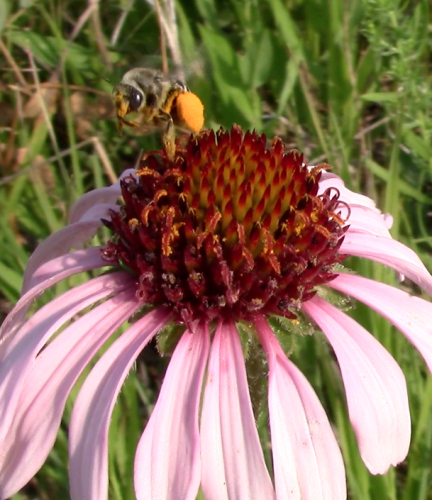 More videos of pollinators visiting Echinacea in the field available on the Echinacea Project Youtube.